With timely hitting and eye-popping defense, Cubs 2nd baseman Javier Baez was an important part of the team's run through the playoffs. Baez was a key member of the line up that ended 108 years of futility for Cubs fans when the team won the 2016 World Series. The bats feature the iconic Blue W, the words "2016 World Series Champions," and all of the highlights of the 2016 season, including final Regular Season record, All-Stars, batting leaders, pitching leaders, and MVP award winners. 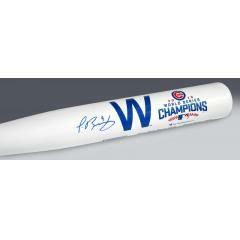 Baez signed each bat, which is fully authenticated by MLB Authentics.